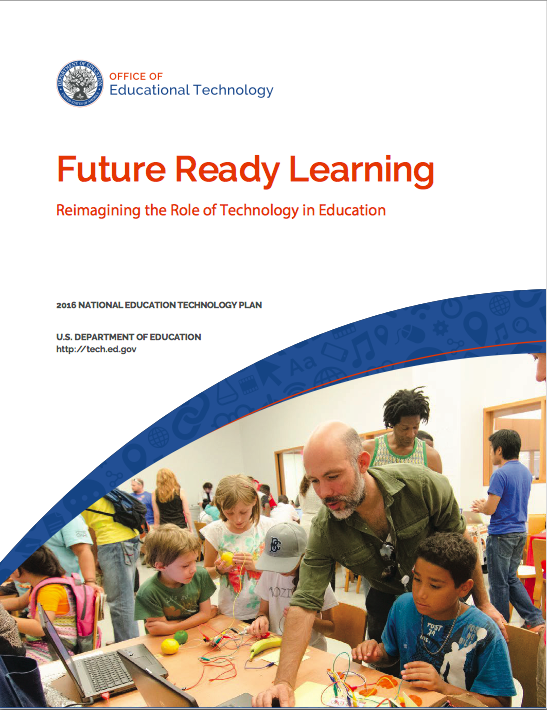 In its 2016 National Education Technology Plan, the Department of Education emphasizes model approaches to digital learning. Several years ago, Heart of Texas Writing Project teacher Katie McKay was working with bilingual fourth graders in Texas to make illustrated comics about the history of discrimination in the United States. To help her students better connect to the material, she also asked them to draw comic strips about microaggressions they faced in their own lives—being left out of a game for not speaking English fluently, for example. Students later used iMovie to turn the comic strips into two animated videos and showed them to younger classes at the school. Tenth grade teacher Jason Sellers, from the Bay Area Writing Project, created text-based video games with his students for a lesson about descriptive imagery. (Unlike video games with graphics, text-based games require players to read descriptions and maneuver by typing commands such as “unlock the door with a key.”) The students composed short pieces of descriptive writing about their favorite spots in San Francisco, then created a game filled with familiar settings and characters. Katie and Jason’s work, part of a collected free ebook called Teaching in the Connected Learning Classroom, was one of several highlighted in the Department of Education’s 2016 National Education Technology Plan, “Future Ready Learning: Reimagining the Role of Technology in Education (PDF).” The new plan lays out model ways of using educational technology in the nation’s classrooms, with a focus on equity and active use. “We really see the plan as a vision for the country of what ed tech could be in our classrooms if it’s implemented in the way we think is best,” Joseph South, the deputy director of the department’s office of educational technology, told Education Week. The most obvious addition to the plan is its focus on the “digital-use divide.” In 2010, when the department published its last National Ed Tech Plan, the phrase “digital divide” usually meant unequal access to devices like laptops and high-speed internet, a severe disparity. But as more students gain access to technology like tablets at school and at home, the concern has shifted to how educators guide students in using that technology. The plan encourages educators to promote more active uses, like computer programming and creative media production in the classroom. In some schools, students publish videos on YouTube, work collaboratively in real-time with classmates with Google Docs, or connect with global experts via Skype. In Chicago, Jennie Magiera’s fourth grade class Skyped with a class in Denver for a lesson about altitude, racing to see whose pot of water would boil first. Those approaches take fuller advantage of digital media’s potential to change practices in and outside of schools. The plan’s authors want educators to move past using tablets or laptops for “passive” activities traditionally done on paper—like multiple-choice tests or worksheets—and support youth in doing work that is reflective of how work is done in the world today. The plan spotlights other Educator Innovator partners like the National Writing Project, EdCamp, Connected Educator Month, P2PU, the Future Ready Schools Initiative, theYOUmedia Learning Lab Network, and the National Park Service who are all using technology to narrow the digital-use divide. Although the report’s audience is largely teachers, administrators, and policy makers, Andrea Ellis, the digital youth engagement manager at the Kansas City Public Library, said she was glad the plan noted the importance of active technology use in informal learning spaces as well as in schools. Ellis runs the Digital Media Lab, an experimental YOUmedia Learning Lab Network where young people connect their technology skills to professional, academic, or other opportunities. She said their “focus has always been on the digital-use divide” and they help youth “use technology for their best interest moving forward.” Learners at the lab compete in stop-motion video contests, create their own 3D-printing designs, learn to code, or follow their interests in open-lab hours. Despite these solid examples, the report’s authors say there is still much work to do to improve technology use in the nation’s classrooms. The plan makes recommendations in five areas: learning, teaching, leadership, assessment, and infrastructure. For example, the authors say there is a great need to improve access to professional development, provide teacher training, and ensure schools have adequate technology infrastructure. Ellis said the 2016 plan should be just the beginning. She said educators need concrete steps on implementing the recommendations and funding to support the shifts.